Let’s face it: your nonprofit’s audience can be very mysterious. Sometimes they donate, sometimes they don’t. Sometimes they’re excited to be a part of your work and other times you can’t get their attention. Instead of letting yourself become discouraged, we want to encourage you to talk to your audience. Granted, you can’t sit down with each of them to uncover answers to all your questions, but you can conduct a nonprofit survey. 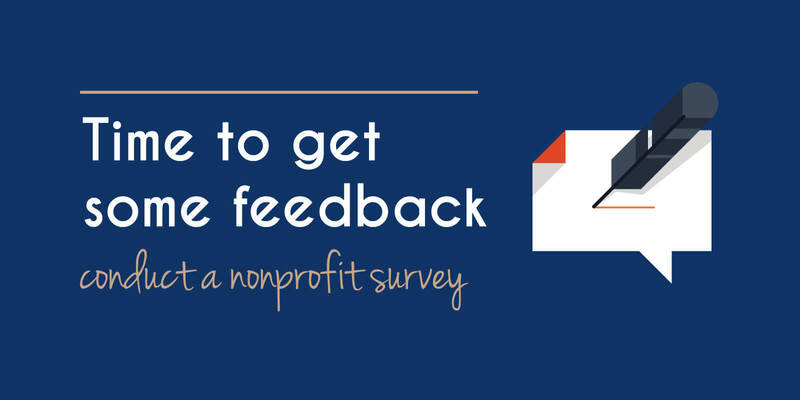 First, why a nonprofit survey? Maybe you already believe in the power of this type of interaction, but if you don’t, boy do we have a case for you! Marketing guru, Kissmetrics, points out how it may be true that you can learn a lot by studying data about users out there, but at the end of the day, you don’t get the answers to one very important piece of the puzzle: the why. Why did or didn’t your donor finish filling out the donation form? Why does or doesn’t your volunteer read your email newsletter? If you can get the answer to these questions, from real users, you’ll have the information you need to start removing any of the obstacles between your audience and the action they take with your nonprofit. You can edit your website forms, tweak your content strategy and rephrase your copy in ways that resonate with your audience. What’s just as notable about nonprofit surveys is that by taking the time to ask your audience questions, you go from constantly talking at them to opening up the conversation. In doing so, you demonstrate you care how they feel and what they have to say. First, check the software you currently use to see if they have an option. You may be surprised that the tool was available to you this whole time. Otherwise, ArcStone has used and been satisfied with Survey Monkey and Google Survey. Capterra wrote up a post on five free survey tools for nonprofits to help uncover additional options. We recently had a client come to us to check on the best practices for a short survey they wanted to send out. Note that the answer to this largely depends on context—how long the survey is and to whom you’re asking questions. For this client, they originally thought sending it out in their newsletter would be best, but we advised against it. Instead, we suggested creating a distinct, simple landing page. This way, the survey would be void of distractions and they could lead to it from other sources besides email. You don’t want to blindly ask questions before knowing where this data will be used. For example, if you’re using this data for your yearly nonprofit report, you want to ask questions that will get you concrete numbers rather than open-ended responses. If it’s merely an opportunity to receive feedback on your most recent fundraiser, you can ask questions that give your audience space to reflect. With this, it’s likely you’ll get some unexpected ideas as they answer questions you didn’t even think to ask. Be open to these ideas as they could help expand your nonprofit’s creativity. Similarly, you’ll want to think about who needs this data. If it’s for your Board of Directors, the language used might look different than if it’s for your web team. With each stakeholder, bring them into the survey development stage so you can ensure you’re asking useful questions in an appropriate way. Surveys rely on a lot of strategy to get answers you need. You don’t have much time before your audience gets bored or busy so your questions need to count. You’ll want to ask specific ones so that your audience understands what you’re looking to know. SurveyMonkey provides templates with tried-and-true survey questions for donors, volunteers and general organization feedback. You also should avoid asking leading questions like, “why did you like coming to our gala?” Questions like these assume something about your audience which can both turn them away and provide incorrect data. In the end, you’ll want to ensure your survey sounds like it’s coming from you. Ask questions you would ask if you were sitting down with each and every survey recipient. As you develop the survey, be patient, ensuring each question will get you the information you need to better serve your nonprofit audience. Need assistance setting your survey up? ArcStone’s happy to help! ⟵Prepping for your new nonprofit website launch? How to get the word out.